Staying at Jolly Carlton Amsterdam Hotel means enjoying the pleasure of refined comfort, in the best of Italian traditions. Its unique style is distinguished by elegant, recently renovated rooms and a high level of attentive, courteous service. Built in 1928, this hotel adjoins the Floating Flower Market in the city's historic centre, just a few minutes walk from the Tuschinski Theatre and Kalverstraat`s multitude of shops. Do you have something special to celebrate, business or private? Private dinners can be arranged in private atmosphere. In an intimate ambience, Italian specialities, straight from the kitchen of Restaurant Caruso, are being served. Theme nights, cocktails or weddings are also some of the many functions that can be held at the hotel. Jolly Carlton Amsterdam Hotel is situated in the heart of Amsterdam just five minutes from the railway station and twenty five minutes from Schiphol Airport, the Jolly Hotel Carlton offers its guests a privileged position for best enjoying the city's numerous attractions: some of the most famous art galleries and museums in the world, the many small jewellery, fashion, book and antique shops, but especially its fascinating architecture, best enjoyed on a stroll along the canals. Most trains stop right outside the hotel and Central Station can be reached within 5 minutes. This delightful Victoria Amsterdam Hotel is a marvel of old Amsterdam architecture and an interesting carved-stone facade. 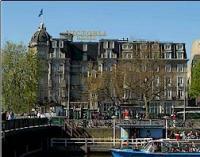 Built in 1890, the Victoria Hotel Amsterdam features contemporary as well as monumental guest rooms. The public rooms have a warm sort of jazzy elegance; there is a covered terrace on the Damrak and just off lobby there's the popular Tasman Bar, made cosy by an open fireplace. Victoria Amsterdam Hotel is in the heart of Amsterdam , opposite Amsterdam Central Station, terminal for train, bus, tram, underground and water taxi. Victoria is easily accessible with direct train service from Amsterdam Schiphol Airport . Trains run every 15 minutes and journey time is approximately 15 minutes. Novotel Amsterdam Hotel is a conveniently located 4 star hotel close to the World Trade Centre and the RAI complex with frequent and direct links by tram or metro to the centre of Amsterdam . 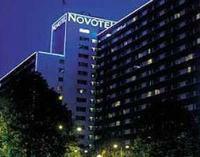 It is fair to say that the Novotel Amsterdam is an excellent choice of hotel for both leisure and business travellers. With 611 rooms, of which 1 suite and 9 spacious executive rooms Novotel Amsterdam is the largest International 4 star Accor hotel of the Benelux .Novotel Amsterdam Hotel is conveniently located at Amsterdam South Centre in the immediate vicinity of the RAI congress centre, the WTC and the Amstel city park. 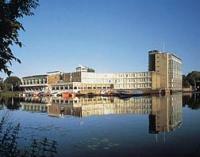 Within 15 minutes from the city centre of Amsterdam , Schipol Airport , Amstel Business Park by public transport from RAI. station which is within 5 minutes walking from the hotel. 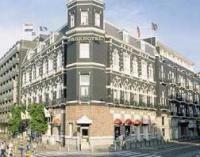 The Nh Schiller Hotel is located in the historic heart of the city on the Rembrandtplein. Conference facilities, department stores, boutiques, museums and canal boats are all within easy walking distance. Nh Schiller was built in 1860. The exterior of the building is very traditional. Now that this hotel has been completely renovated, it is without doubt one of the best first class hotels in Amsterdam , as are the other hotels in this chain, i.e. the Doelen and the Caransa. Besides that; the building retains many wonderful examples of art nouveau decoration, nearly all of which has remained intact since the hotel was built in 1912. Being located in the centre of town, NH Schiller is close to some of Amsterdam 's most popular restaurants. Utrechtsstraat runs off the Rembrandtsplein and has several highly recommended restaurants by Dutch Food Guides. 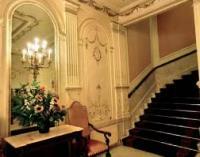 With just 85 rooms, the NH Doelen has the feel of a private mansion. A domed clock crowns the impressive redbrick and stone building, originally part of the city's 16th-century ramparts. The six-story atrium lobby, ringed by galleries, features delicate moulding, gold-leaf decoration, a grandfather clock, and grey marble floors. Over the years, the hotel has hosted such illustrious guests as Elisabeth (Sissy), the 19th-century Empress of Austria and Queen of Hungary. It is also at this site where Rembrandt purportedly painted his famous Night watch. The Doelen's quiet location on a side street in the centre of town makes it a popular choice for vacationers and business travellers. The hotel's sunny breakfast room, with large windows overlooking the Amstel River , serves a daily buffet breakfast. 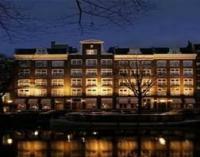 The hotel is located in the heart of Amsterdam on the Amstel River and its famous canals. The hotel is famous for its history (Rembrandt's Nightwatch was painted at the hotel, and this part of the old City wall is still there) and all the famous guests who have stayed with Nh Doelen in the past, like Empress Elisabeth (Sissy) from Austria and Sarah Bernard. 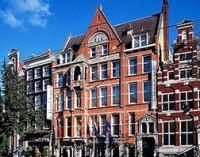 The Gresham Memphis Amsterdam is a deluxe hotel located in the fashionable heart of Amsterdam . With its ivy- covered facade, this hotel is the perfect place to sample the charm of one of Europe 's most cosmopolitan cities. Ideal for sight seeing, the Gresham Memphis is within walking distance from the famous Rijks Museum, Van Gough Museum and Heineken Brewery tour. A lso the surrounding area is packed with boutiques, charming cafes and tempting bistros. Gresham Memphis is situated in fashionable Old South District, within walking distance to the heart of city and, World Trade Centre and close to RAI Exhibition Centre. The frequent tram outside the hotel takes under 10 minutes to reach the Dam Square and infamous red light district. The charming 4 star Estherea Hotel overlooks one of the cities tranquil canals. The hotels has been proudly run by the same family since 1942 and offers a warm welcome to all their guests, many of which come back time and time again. However, being on a quiet canal side street hides the hotel from the hustle and bustle of Amsterdam city centre. The family pride themselves on their high standards, each of the 71 comfortable rooms are beautifully furnished to create that "home away from home" feeling. The elegant hotel features excellent facilities as well as friendly and attentive staff that are always happy to assist guests in making their stay comfortable. Estherea Hotel is just a short walk from Central Station, main shopping area, Ann Franks House and theatres; only 300 metres from the Dam Square and the Royal Palace. Central Station, the main shopping district, museums and theatres are all within walking distance. The hotel is housed in a monumental 18th Century building, proclaiming a rich history, being built in the first brewery of Heineken. 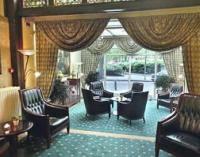 The hotel offers cosy and comfortable accommodation in traditional and stylish surroundings. After the renovation "Die Port van Cleve" was reopened on May 28th, 1997 by Mr. A.H. Heineken, President Director of Heineken Holding and grandson of Mr. G. A. Heineken - who founded the Heineken company on the spot where "Die Port van Cleve" is located now. At this beautiful location, surrounded with canals, nearby the shopping and entertainment centres, you can enjoy the real Dutch atmosphere. Its interior has been completely modernized, while preserving the original decor of the Bodega De Blauwe Parade Bar. Its location and history makes it popular with leisure travellers, but it's also appreciated by business travellers for its warm, personalized service and modern comforts. 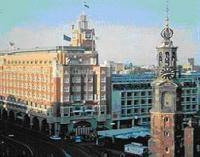 Hotel Die Port Van Cleve Amsterdam is located in city centre, just behind the Royal Palace on the Dam Square . Hotel is located in five minutes walking distance along Nieuwezijds Voorburgwal street from the Central Station. Overlooking the Singel Canal , Park Hotel features a typical Dutch facade of dark brick with white trim and a turret. The modern lobby has pink-marble flooring and pale-yellow walls, tall windows, and a small sitting area. The hotel's central location on major tram lines and within easy walking distance of museums, shopping, entertainment, and dining makes it popular with vacationers. 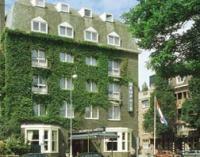 Park Hotel located in the exciting city centre of Amsterdam . The hotel is located between the famous Leidsesquare with its cafes, terraces and restaurants, and the Museumsquare with the Rijksmuseum, Van Gogh Museum and Stedelijk Museum . The Vondelpark, Europe 's largest casino and the P.C. Hooftstraat with its exclusive shops are only a stroll away. Just across the street, canal boats are available for a tour along the Amsterdam canals. 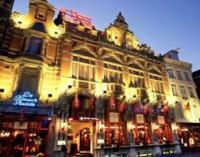 This hotel is located in cultural and financial centre of the city, between the Royal Palace , Dam Square and Central Station. It has 137 rooms and 11 suites, 2 non-smoking floors, nicely decorated "Duke of Windsor" brasserie-bar which reminds one of the Orient Express, 2 conference rooms for up to 55 people, sauna and solarium, 2 public car parks near the hotel. Le Meridien Apollo Hotel with a garden setting overlooks the confluence of five canals. Le Meridien draws many corporate travellers. But its renowned restaurant, comfortable lounge, and easy walking distance to shopping and museums are also attractive to vacationers looking for a hotel away from the crowds. Guests in search of luxury in this famed city will certainly not be disappointed by choosing Le Meridien Apollo. Le Meridien Apollo Hotel is ideally situated near the centre of Amsterdam , the RAI Congress Centre, and the World Trade Centre. Le Meridien Apollo is situated in the Museum Quarter. The museums in and around this district give it its name and include: The Rijksmuseum, Van Gogh Museum and the Stedelijk museum. Amsterdam 's more exclusive shops are to be found in this area. In between shopping and visiting museums, you will be able to find a variety of nice restaurants and bars.